Benjamin Ryall was born in Thornford, Dorset, just southeast of Yeovil, around 1801, the son of William Ryall and Mary Ann née Baverstock. William Ryall and his brother Thomas were fairly affluent and both owned properties in Thornford and other members of the family also feature in the Land Tax Returns of the area. The Ryall families were Nonconformists, illustrated by the wholesale christenings of their children, some as adults. William and Thomas were founder members of the Methodist Circuit at Blandford Forum and Thomas eventually became an elder of the Methodist church at Sherborne. Benjamin Ryall became a draper and had shop premises in the Borough (today's 8 High Street, the current premises of Clement White). Below is a sketch, made by GE Madeley to illustrate his map of 1831, showing the Borough seen from High Street - roughly the view seen today from the north end of King George Street. 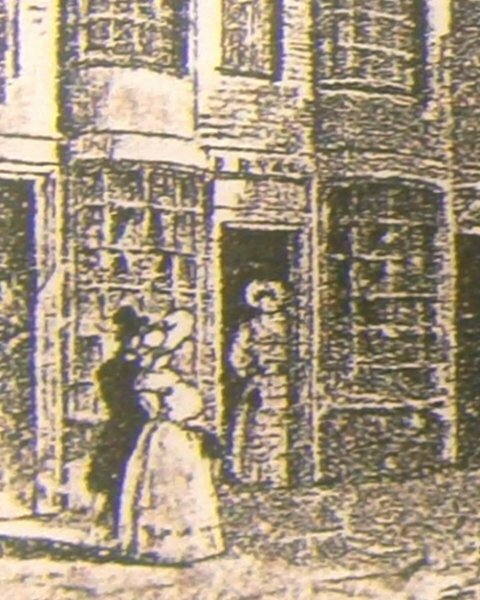 The building at far left is clearly the same building as today's 8 High Street, and at this time was occupied by Benjamin Ryall whose name appears above the door. Pigot's Directory of 1836 lists him as a Linen Draper. On 28 January 1832 Benjamin applied for, and was granted, a Licence for Marriage at the parish church of Crewkerne, St Bartholomew, where he married Ann Hoskins (b 1806) on 6 February 1832. Ann was the eldest daughter of John Hoskins and Susannah née Geeve (or Gear), her father originally being a tailor but latterly the landlord of the Swan Inn and later the George Hotel, both in Crewkerne. Benjamin and Ann were Nonconformists (who were allowed baptisms, but not marriages) and their son Benjamin Baverstock Ryall, born 4 September 1833, was baptised in Yeovil by the Nonconformist Minister John Jukes on 17 November 1833 and the baptism recorded in the Independent Church Register of Births of Yeovil. Their second son William (born 15 June 1835) was similarly baptised on 13 September 1835, followed by son John Hoskins (born 2 December 1836) and baptised 11 June 1837. Benjamin was also involved with local charities and in 1835 he was a trustee, along with bookseller William Porter and solicitor James Tally Vining, of the newly-formed Female Guardian Friendly Society. At a Vestry held on 28 March 1839 Benjamin was appointed as one of Yeovil's four Overseers. In the 1841 census Benjamin and Ann were listed in High Street with their children; Benjamin Baverstock (1833-1853), William (1835-1843), John Hoskins (1836-1896), Thomas Hawkins (1839-1891) and Ann Frances (1840-1844). Also living with them were two draper's apprentices, two draper's assistants and two domestic servants. In Hunt & Co's Directory of 1850 Benjamin was listed as 'Linen & Woollen Drapers' of the Borough while he had two listings in Slater's Directory of 1852; the first as Linen Drapers of High Street and the second as a Life Insurance Agent of the United Mutual Insurance Company. On the night of the 1851 census Ann was away visiting relatives but Benjamin was recorded in High Street as a 'Draper employing 6'. Listed with him was Benjamin Jnr, a draper's assistant, John, a draper's apprentice, two new daughters Susan (1843-1878) and Mary Ann (b 1845), as well as three draper's assistants, a draper's apprentice and two house servants. He was also a Burgess of Yeovil and in 1854 was elected as the town's last Portreeve. This year was a time of great political reform in Yeovil and was the year of the formation of the new Municipal Borough. The medieval Portreeve and Burgesses, together with the Town, Improvement and Special Commissioners, ceased to exist. Benjamin's last official act was recorded in the Western Flying Post "This being announced to Mr Benjamin Ryall, the late portreeve, he entered the council chamber, preceded by his mace-bearer, and handed over to the mayor the ancient corporation seal, the mace and other insignia of office". The first Mayor of Yeovil was, coincidentally, John Ryall Mayo - although there appears to be no family connection. Benjamin Ryall died in Yeovil of heart disease on 17 March 1856, aged 57. His obituary read "March 17, Mr Benjamin Ryall, draper, aged 57 years. Mr Ryall was much respected as one of the tradesmen of this town, and in public matters was useful and liberal. He was the last Portreeve under the ancient government of the town, and on the new Corporation taking office he delivered up to the first Mayor of the borough the mace and other insignia which had been for so many centuries handed down from one Portreeve to another." Ann, assisted by one or more of the sons. ran the business after Benjamin's death and is listed as a draper in the 1861 census. 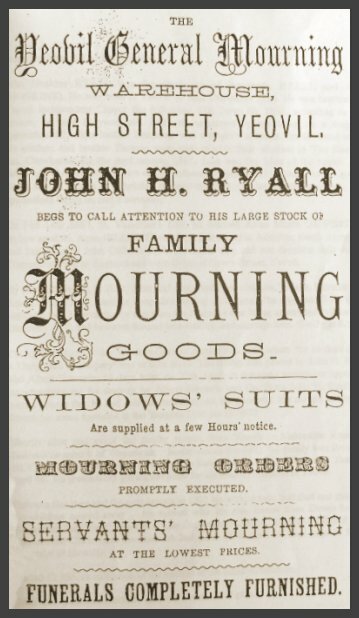 Ryall & Son was listed as Linen & Woollen Drapers of High Street in the Post Office Directory of 1866 and in the same directory was a listing for Ryall & Son, Hearse & Mourning Coach Proprietors of High Street. The latter, certainly, was managed by Benjamin's son, John, as witnessed by the advertisement shown below. This sketch, made by GE Madeley to illustrate his map of 1831, shows the Borough seen from High Street - roughly the view seen today from the north end of King George Street. The Shambles is to the left and the Market House is to the right. The buildings at far left still stand today, that to the left is Clement White's shop, today's 8 High Street, at this time occupied by draper Benjamin Ryall whose name appears above the door. 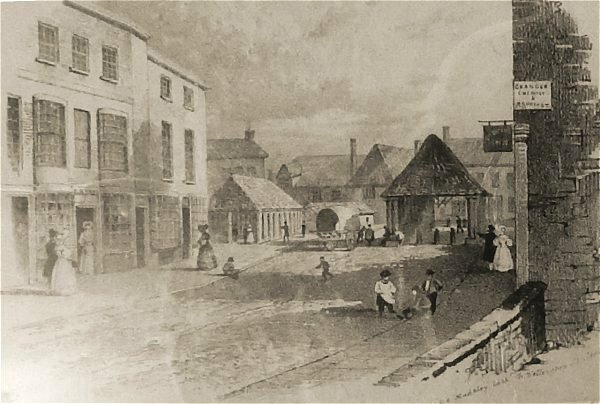 Behind the Market House and the hanging sign at right is the original Medical Hall (it was rebuilt in 1860) which at this time was occupied by George Wellington, druggist and chemist. An enlargement of the shopfront seen in the previous image, showing 'B RYALL' over the door. 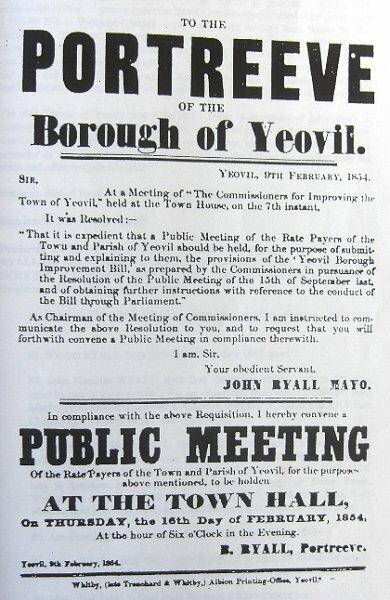 Poster advertising a public meeting in 1854 called by Benjamin Ryall in his role as Portreeve, in answer to the request of the Improvement Commissioners. An advertisement placed by John Hoskins Ryall, Benjamin's third son, who took over the business after his father's death.